Its not a dream and its not a photoshop, the tree shown above is a naturally occurring species known as Eucalyptus deglupta, otherwise known as the "Rainbow Eucalyptus" which sheds its bark to reveal a spectrum that would make Crayola jealous. The unique color properties of the species occur when patches of the bark peel off in irregularly-sized chunks. As the soft green interior of the trees slowly matures and dries, the newly forming bark begins to take on bright new hues in a variety of colors as different parts of the plant age separately. 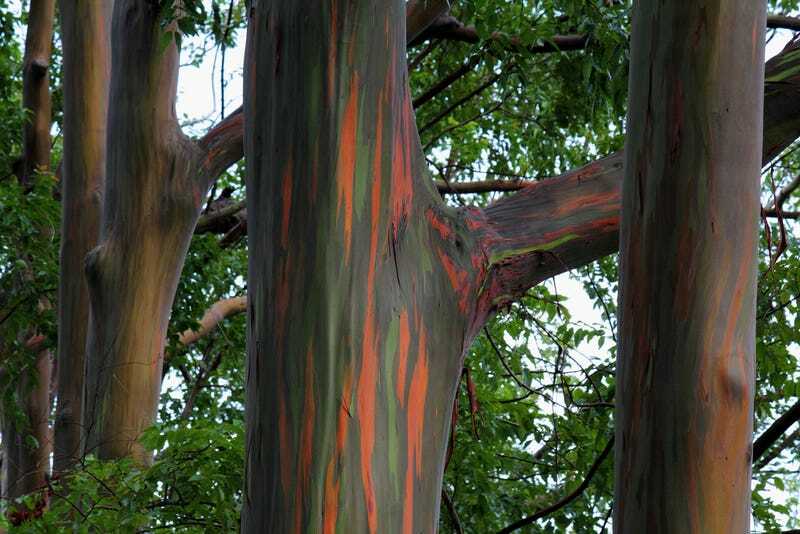 While the Rainbow Eucalyptus is sometimes grown for its aesthetic qualities, it is mainly harvested for paper pulp. Check out some more pics of the fantastical tree below!